A shower gel with a lavender fragrance that softens, cleanses and replenishes the skin. Rich in pure organic botanicals and natural Lavender fragrance, this indulgent shower gel naturally cleanses and softens skin. Leaves skin deeply refreshed, beautifully scented, and visibly glowing. Mild and soap free, it maintains your skin’s natural protective layer to deeply cleanse without drying. Enriched with Chamomile, Licorice and Rosemary extracts, it leaves skin feeling smooth and hydrated. Free from soaps, sulfates, parabens, silicones, PEGs, artificial colors, and fragrances. Aqua (Water), Sodium Lauroyl Sarcosinate, Cocamidopropyl Betaine, Decyl Glucoside, Glycerin, Saccharide Isomerate, Lavandula angustifolia (Lavender) Flower Extract, Calendula officinalis Flower Extract, Rosa gallica Flower Extract, Chamomilla recutita (Matricaria) Flower Extract, Sambucus nigra Flower Extract, Glycyrrhiza glabra (Licorice) Root Extract, Viola tricolor Extract, Viola odorata Flower/Leaf Extract, Achillea millefolium Extract, Rosmarinus officinalis (Rosemary) Leaf Extract, Origanum majorana Extract, Hamamelis virginiana (Witch Hazel) Extract, Equisetum arvense Extract, Urtica dioica (Nettle) Extract, Melissa officinalis Leaf Extract, Mentha piperita (Peppermint) Leaf Extract, Salvia officinalis (Sage) Leaf Extract, Melia azadirachta Extract, Fragrance/Parfum*, Aloe barbadensis Leaf Extract, Honey, Hydrolyzed Soy Protein, Guar Hydroxypropyltrimonium Chloride, Ethylhexylglycerin, Phenoxyethanol, Sodium Benzoate, Potassium Sorbate, Citric Acid, Linalool*, Limonene*. *From Natural Essential Oil (Lavender – Lavandula angustifolia). • Lather a generous amount onto damp skin before rinsing thoroughly. 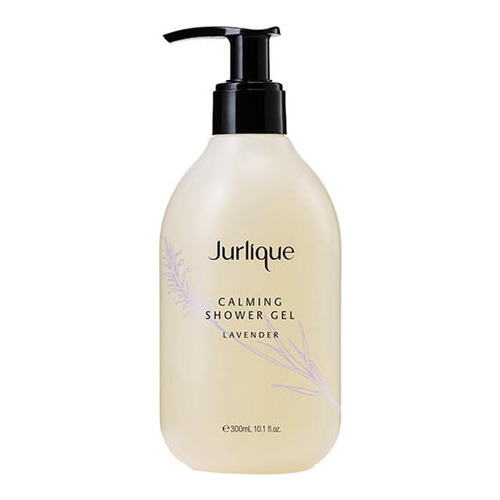 • Follow up with Jurlique Calming Lavender Body Lotion.